Brilliatech have been with automechanika from 2013. Brilliatech have much products in Germany and Europ. Magic Clay Bar around the world. 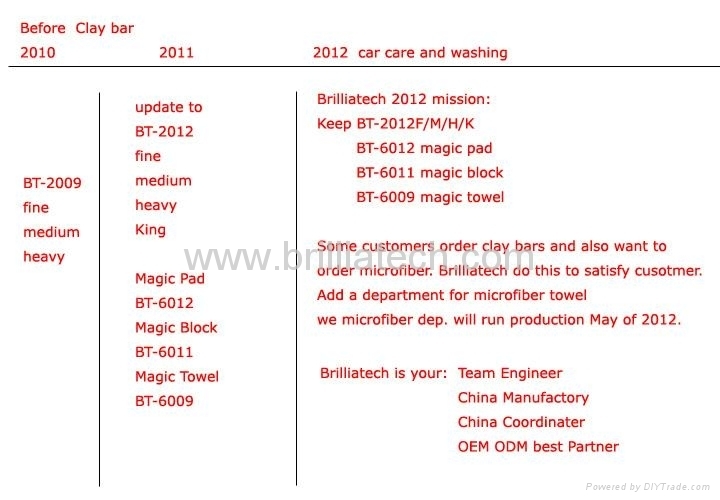 Brilliatech want to know what is customer voice of magic clay bar products? Brilliatech 2015; Brilliatech on Automechanika Shanghai. show on the Automechanika Shanghai. thanks for more csutomer support us. Brilliatech go to more and more countrys. More customer know Brilliatech do Magic Clay Bar. Our prodcution Manager also face to face with our cusotmers in the show. when we go to carton fair; some trade company ask us, why you also go to carton fair? so, we have beed stop carton fair, and give trade company a chance. but we go to carton fair every time, if we have time. we visit the trade company booth, and ask them what some issue from customer. magic clay bar keep a good price and very good health on marketing. The First Time for Brilliatech go to a show. current only for a little products; as the magic clay bar and magic lcay pad. 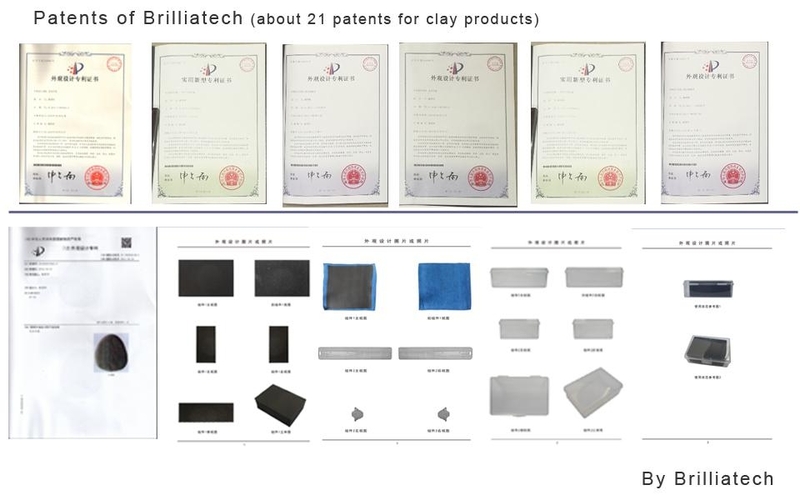 Brilliatech can do the clay bar in more color and more grade to satisfy customer requirement. the magic pad, magic block,magic towel items are also can do different color and stlyes. and also add a new microfiber production line from May of 2012. when you do order for clay bar, also can buy the microfiber from us. save your time and money. 2011-2012: Brilliatech updated old item no to BT-2012. have 4 grade: fine, medium, heavy and King. Brilliatech clay bars: no fade!! No falloff for use. Based more color and more grade for you choose. 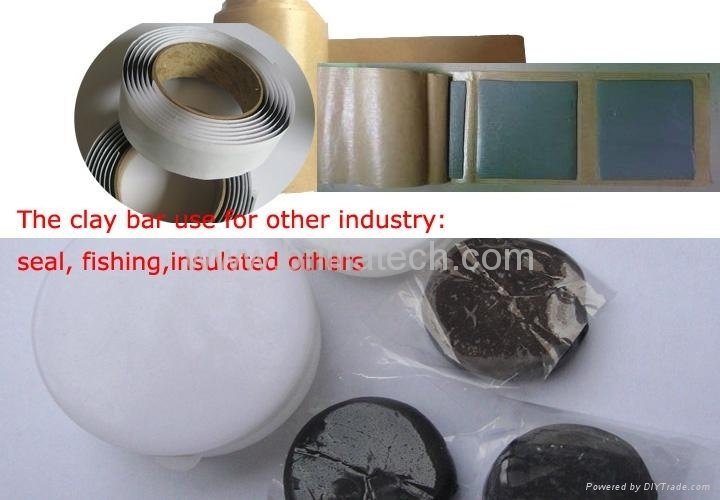 We also can custom clay bars according to you request for different industry. What is the clay relation? Please check the picture. Magic PAD(BT-6012) and Magic Block(BT-6011): it is very nice item for new marketing. 2009-2010: Brilliatech have do car care washing and some car accessories. And have add more Packing Box for clay bar. And have developing more clay for other use: for fishing and industry. 2008: some Japan customer like the clay bar and also ask us to support they for car accessories. Brilliatech have source the fabric pocket for car room use. We have solve some problems: such as break (falloff ) and fade color. 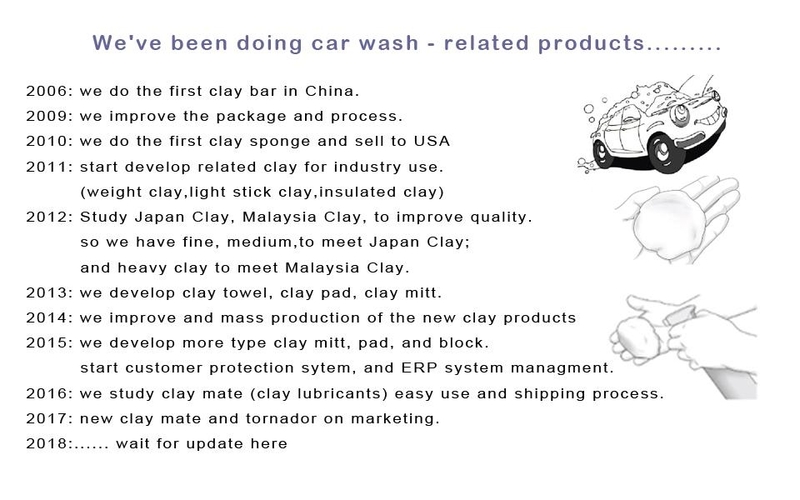 2004: we have start the clay bar in soft and hard grade and made by machines: and we do blue clay bar only. 2002: Study and innovate the elements for clay, the first clay bar made by hand.